This is probably the product that had the most variety in options. Many say to mix a bottle of your favorite conditioner with vinegar. Some just said to put Vinegar in your Downy ball or the compartment for liquid fabric softener in your washer. This is how I learned that Vinegar is a natural softener. (By the way, baking soda is also a natural softener so the homemade laundry detergent will already have some softening properties). For the variations that included conditioner, I learned that the conditioner was just for the smell. I settled on a liquid recipe. There are also many options out there for “dryer sheets” if you prefer that. I thought they seemed like a bit of a hassle so wanted something that I could put in my Downy Ball. IMPORTANT: This one is quite the chemistry experiment. It is very important to mix the baking soda, water, and essential oil into a paste FIRST. Then SLOWLY pour in the vinegar. It will fizz up a lot so if you dump it all in at once, you will have a mess. Once this is mixed, the baking soda will settle in the bottle. Give it a good shake to mix it up each time you use it. I use about ¼ cup in my Downy Ball. Some sites say to use ½ cup but I have found that ¼ cup works just fine for us. I use distilled water because I read on one site that it will reduce the likelihood of creating a petri dish with the natural ingredients. I tend to think that vinegar would prevent this, but decided at $0.88 per gallon, distilled water was a good safeguard and I use it in all the products that call for water. For those of you who follow my regular blog, please don’t go away! 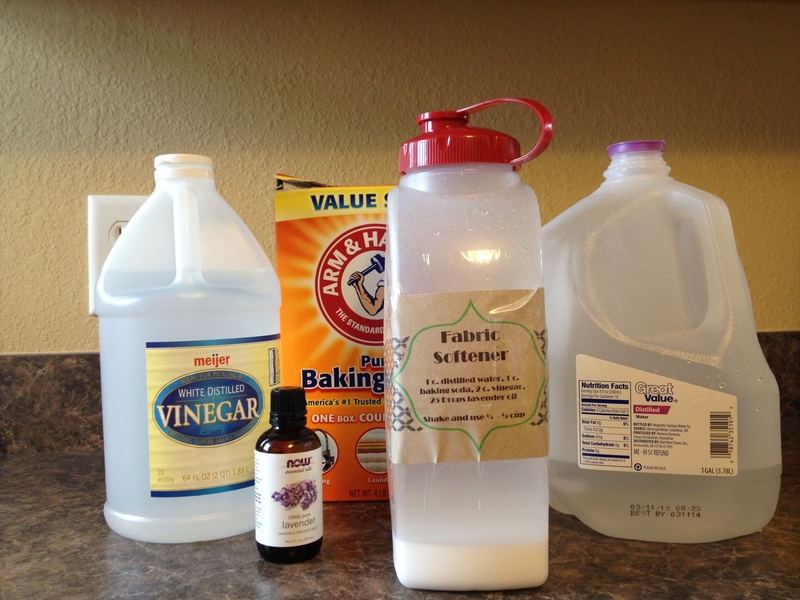 I am diverting from my normal posts for a series on DIY natural cleaning products. I want to break it into a series of posts so that people can easily find information on specific products later. If you aren’t interested in this topic, please don’t unfollow this blog. I will return to my regular programming after this cleaning intermission. J Email followers, you will probably get a series of about 10 emails in pretty rapid succession as I plan to post these all at once. Once the initial flurry is finished, my blog life will return to normal. This is the first DIY cleaning product that I saw. Before that, it really hadn’t occurred to me to make my own. My cousin posted this on her blog as a money saving alternative to store bought detergent. When I started researching natural products in earnest, I was surprised to find that this fell into that category. I have chosen to use Fels Naptha soap in this detergent because I felt that a laundry soap would be more effective. However, I have seen variations that call for the milder Ivory soap or an store bought all natural soap (like Bronner’s soaps). It is simple and very inexpensive to make, regardless of what soap you choose. Mix the first two ingredients together. Using a hand grater, grate the Fels Naptha soap. It is yellow so will actually look like grated cheese. Then put the grated soap in a food processor and pulse until it is broken down into a very fine “powder”. Mix with the dry ingredients, close container and shake. I found all 3 ingredients in the laundry soap aisle of Walmart. 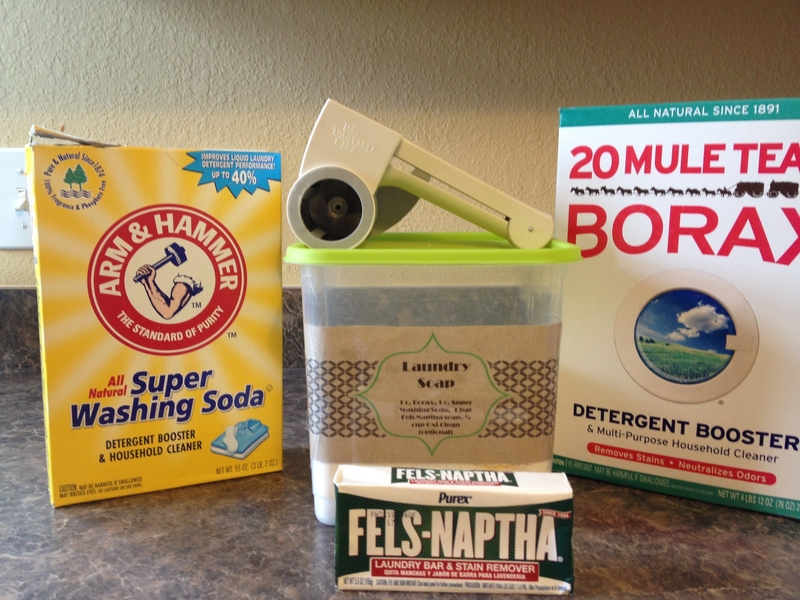 The boxes of Borax and Super Washing Soda will easily make 6 batches. The total cost for 6 batches (including 6 bars of soap) is about $12.50. High Efficiency washers need about 1 Tablespoon of this. I do NOT have a high efficiency washer so I use about a Tablespoon and a half (use more for heavily soiled clothes). Each batch makes 3+ cups. At 1 ½ Tablespoons per load, this translates to 32 loads. Six batches should wash 192 loads. Total cost per load is $.065 per load. Additional note: I made some of this for a friend and she asked if it was good for sensitive skin. That prompted me to Google “DIY natural laundry soap for sensitive skin”. This exact recipe popped up in several blogs. Comments on those DIY blogs indicate that it is indeed good for sensitive skin. Some people commented that they have family members with extremely sensitive skin or eczema and that this worked great for them. If you don’t want to take your chances, replacing the Fels Naptha with an different bar soap should eliminate any worry. For those of you who follow my regular blog, please don’t go away! 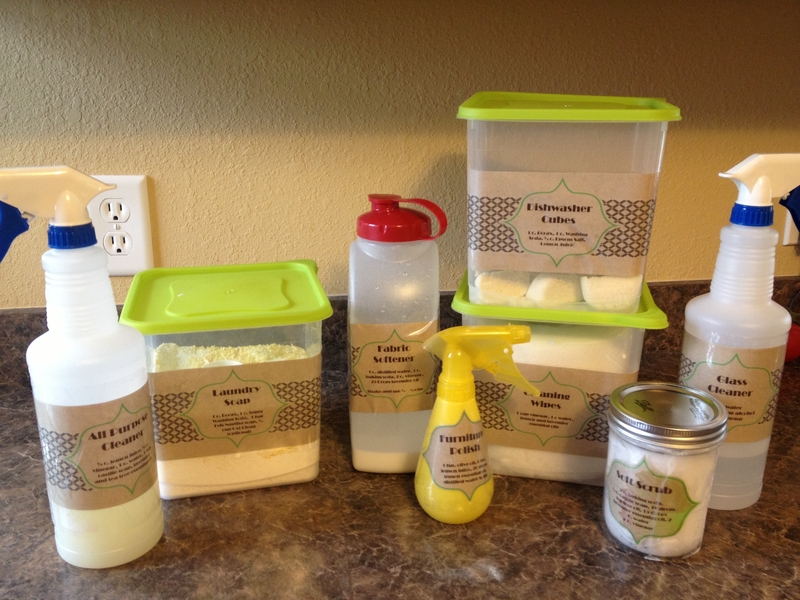 I am diverting from my normal posts for a series on DIY natural cleaning products. I want to break it into a series of posts so that people can easily find information on specific products later. If you aren’t interested in this topic, please don’t unfollow this blog. I will return to my regular programming after this cleaning intermission. Email followers, you will probably get a series of about 10 emails in pretty rapid succession as I plan to post these all at once. Once the initial flurry is finished, my blog life will return to normal. As soon as I get all the posts uploaded, the product list below will link to the related post. Today’s Advice to My Beautiful Daughters – Take care of your environment and take care of you. 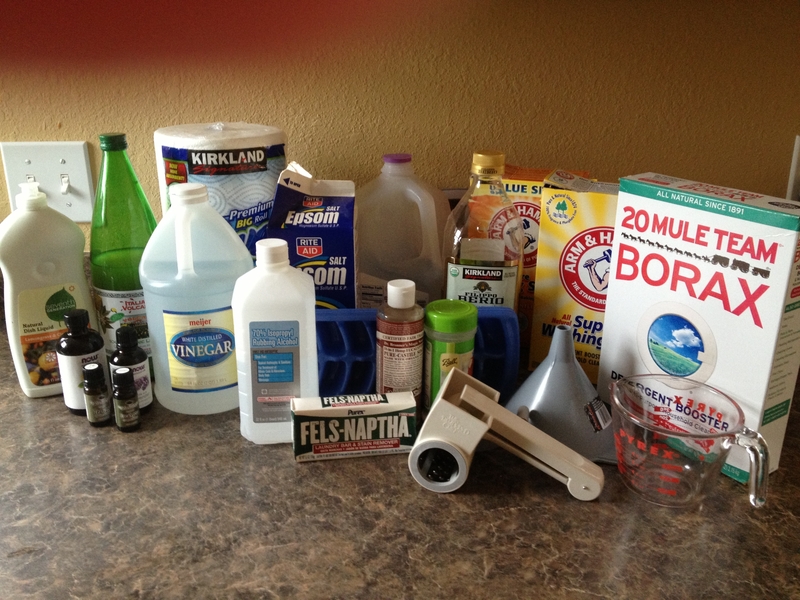 A few weeks ago, I started researching natural cleaning products of the DIY variety. I don’t know exactly what prompted it. For a long time, I have made the effort to buy cleaning products that are labeled as environmentally friendly or “green” but they are expensive and I wasn’t convinced they were as good as they were purported to be (with the exception of the REALLY expensive stuff that I couldn’t bring myself to spend the money on). I was inconsistent to say the least. Then a few months ago, my cousin, who has a great blog, wrote a post about DIY laundry detergent. At the time, that seemed just a little over the top. But I didn’t forget it. I think she gets the credit for getting my wheels turning. Pinterest is a great source of information, so I started pinning and researching and pinning some more. I created a board for all the stuff I was finding. I noticed that there were lots of common elements to the products. Some had more focus on natural, others had more focus on DIY and saving money. I decided to focus my research on DIY AND natural. First, I’ll mention my key learning and then I will get into the actual products I have made and how I adjusted them to make them work after my first try. First, I learned that vinegar is the bomb! It does just about everything. It disinfects, it sanitizes, it softens, it cleans and it is cheap! I learned that baking soda is both a softener and can be an abrasive (like for sink cleaning). I learned that Borax is a natural element that has been used for cleaning for a long long time. I learned that washing soda is just baking soda that has been baked (or something like that). This process increases its cleaning properties but maintains the natural characteristics. I learned that essential oils have all kinds of aromatic, disinfecting and cleaning properties as well. There are TONS out there. I’ll tell you more about the ones I settled on later. Essential oils are the only pricey ingredient that I have used. Everything else that goes into these are either things I already have in my pantry or were very inexpensive. All of the products could be made without them for the truly budget conscious, but I think they make a big difference in how my house smells. In other words, the aromatics were important to me, especially since I learned that my kids hate the smell of vinegar. Pinterest was great for finding lots of information, but when I got ready to actually make my first batch of products, I found it to be a bit disorganized. Lots of sites list multiple products in a single post (or pin) and I started to have trouble finding the things I wanted to make in the midst of all the noise. Because I had pinned everything I thought had promise or good information, I couldn’t find the things I wanted to make easily. For that reason, I will be breaking this into a series of posts. This is the introduction. After this, I will make one post per product so things don’t get lost in the shuffle. It will also be the way I re-organize my own boards on Pinterest so my adjustments are easy for me to find later. These are the products I have made so far and I love them all. I will be sure to tell you what makes my favorites so fabulous, but I really do like them all. Click here to see or follow my “All Natural” Pinterest board.